You’ll probably recognize the fourth Alien film, Alien Resurrection, as the one you get stuck with when you buy the film collection. It represented a pretty far-out-there departure for the series, and took the Ripley character in directions few people seemed to care much for. Regardless, the popularity of the franchise – and the obvious crossover of a younger, male audience – meant a video game tie-in to the film shouldn’t be a surprise. The fact that it’s actually pretty good, is. Alien Resurrection tries to freshen up the series by taking place hundreds of years after the first three films. Ellen Ripley (Sigourney Weaver) has been cloned from preserved DNA, allowing the military scientists aboard the USM Auriga to extract the alien queen left within her from the events of Alien 3. The experimental cloning process has left Ripley with touches of the Alien’s toughness and sociopathic tendencies – both of which come in handy when the Aliens our reckless scientists bred naturally escape and overrun the ship. The game starts you off as a weakened and unarmed Ripley in the opening moments of the breakout. Taking a page from Half-Life, you get used to the interface and appearance of key consoles around the ship in relative safety, while scripted sequences of destruction and mayhem occur around you. Once you find your first weapon, it’s time to complete an updating series of repair tasks across the game’s 10 enormous levels, fight a few nasty bosses, and defend yourself from Alien and military goon alike. The bugs are back in town. In a neat touch, you won’t do this alone. Alien Res has four playable characters you’ll switch among at the start of each level. All characters have the same basic stats and controls, but different starting equipment. Call begins with a motion tracker and exclusive access to a laser weapon, Private DiStephano has an automatic rifle, and dreadlocked Christie sports the twin pistols he carried in the film. These character switches also help to add some variety to the gameplay, by restarting you in different situations without resorting to the old “take all your equipment away at the cutscene” cliché. You’ll always switch to a character carrying equal or better weapons, but the loss of medkits and ammo you’ve accrued with the last character resets the “survival horror” vibe and keeps you from simply cakewalking through the entire game. Gameplay takes detailed notes from System Shock 2. Each level has a set of mission objectives that need to be completed, as well as doors locked by keys or groups of switches. Most of your objectives revolve around keeping the ship afloat (aspaced?) long enough to make it to an escape craft, though Ripley does insist on going off on one of her patently unwise tangents and personally destroying her seven previous failed clones. Nods to the movie are worked in as well, ranging from NPC characters (like scientists and victims) recognizable from the film, to underwater sections with Aliens displaying their creepy swimming animation. There’s no shortage of Aliens stalking the ship, and every single one of them is appropriately nasty. They’re fast, quiet, and deadly at close range. Four to six good swipes will end you, depending on which of the claws, spiked tail, or puncturing inner jaws the attacking Alien decides to use. They can also leap short distances, and knock off a third or more of your health if they connect. They swarm like pack animals too, with groups of three or four not uncommon, and crawl along ceilings and vents to come at you from unexpected angles. The occasional scripted sequence will even have them smashing through locked doors, or chasing hapless survivors out of the corner of your eye. Any bullet shot toward a facehugger isn’t wasted. But the nastiest bastards are actually the facehuggers. They’ll pop out of eggs littering the ship’s corridors, or leap out from behind crates or shadowed corners. Any hugger that closes the distance latches onto your face in what amounts to a one-hit kill. The game isn’t over though – you’ll wake up with a new “chestburster meter” quickly draining, and have about a minute to locate and use a portable autodoc to cut the parasite out. Run out of time, and you’ll get to experience it fatally tearing out of your chest in first person. Huggers also know how to “play dead,” and will surprise you by popping back to to life once you’ve passed them, if you haven’t finished the job. You at least have a beefy arsenal to fight back with. Every character gets an infinite-ammo pistol, good for clearing debris and greasing facehuggers. From there, you’ll find shotguns, pulse rifles, flamethrowers, electric guns, and even grenade and rocket launchers. Each gives a distinctive “kick” through the Dual Shock’s rumble feature, and the rifle especially rocks and rolls on full auto. Pickups include a recharging flashlight, 360-degree motion tracker, and various sizes of health kits. Health is always very limited. Ammo less so, but you’ll never build up a worry-free stockpile. Both limits give a good balance between survival horror and FPS, and definitely encourage you to stalk cautiously through the halls. Limited saves (at specific save stations) also promote careful gameplay without treading too far into frustration. The game sports a very impressive engine for the PS1. Everything is full 3D, with multi-levels, platforms, and ladders and vents all present. Polygons aren’t in such abundance as in modern games, but what are here are enough to give the hallways unique and interesting shapes. 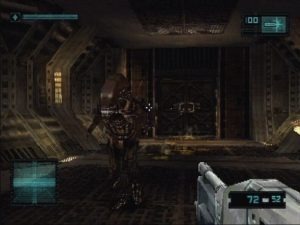 The film’s rusty color palette is replicated well, and the virtual version of the ship matches and expands upon what was seen on the screen nicely. Lighting effects are also excellent, with all the necessary flickers, flashes, shadows, and red emergency strobes needed to create an appropriately foreboding atmosphere. There’s a fairly short draw-in distance, but it works well here, as the hallways ahead fade into inky shadows with potential monsters hiding within. Ship security will also try to stop you, for… whatever reason. Atmosphere is further provided on the auditory front, with excellent environmental effects and Alien screeches right out of the Fox archive. Except for the title menu, there’s no music of any kind. This leaves you to wander eerily quiet hallways and listen for Aliens through background hums of equipment or clinking of chains. Distant, echoing sounds of screams and gunfire suggest battles elsewhere in the ship, and the chirps of the motion tracker raise hairs on the back of your neck just as they did in Aliens. The ship’s computer, “Father,” also updates on the continually-degrading status of the ship in a calm, monotone voice. Later, even he gets counted among the decaying systems, and his increasingly garbled warnings start to take away the last friendly voice on the ship. Controls are about as sharp as they can be for an early console title, provided you have the right gear. The standard PS1 pad does the job, but steering around with the D-pad isn’t recommended. If you have the Dual Shock, you’ll be able to control this just like any modern console FPS (one stick to move, one stick to look). This method is responsive, relatively precise, and very smooth. The PlayStation’s expanded number of buttons give the ability to cycle back and forth through weapons and inventory separately, so there’s little delay in getting to the piece of kit you need. You can even mash down on the right thumbstick to do a quick 180-degree turn – very useful for when Aliens sneak up on you. The game doesn’t feel like a “gimped” console FPS either. Auto-aim is present but at a minimum, and some skill and quick aiming will still be required. Headshots do count, so precision is both possible and rewarded with extra damage. Alien Res also gives some consideration to body awareness. You can’t look down and see your character’s body, but the camera does move in a very realistic fashion – running speed isn’t very fast at all, the camera bobs and shakes accurately, and it takes some time to move from standing to a crouch. It’s a neat system that gives both guns and movement “weight” to them, and works well to bring you closer to being in the situation, and further from controlling a floating camera with a gun in front of it. It’s a pretty great Aliens experience, but the game does have its flaws. First and most obvious is that, while this is an amazing engine for the first PlayStation, it’s also an engine for the first PlayStation. Flat, low-resolution textures are the only kinds to be found, and texture tearing and warping are the rule, not the exception. Textures don’t appear to be able to show any true translucency either, so effects like hissing steam and blood splattered on walls take on dithered, dot matrix look. It’s a great console engine for the time, but even with that in mind, there’s a lot of ugly you’re going to have to turn a blind eye to. 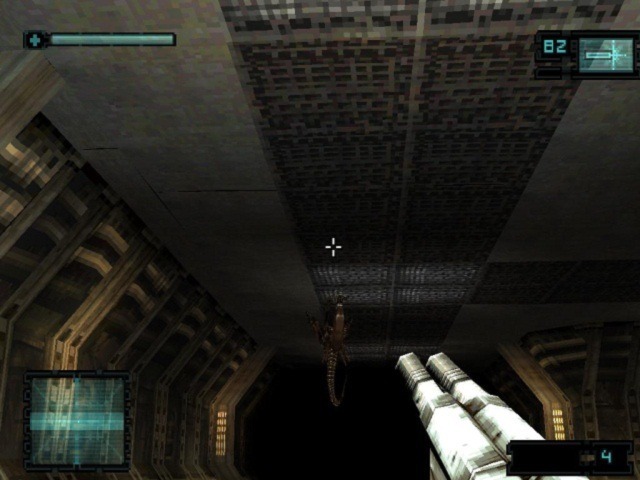 Aliens have a number of scripted entrances, including rushing up from the ceiling. The controls aren’t perfect either. 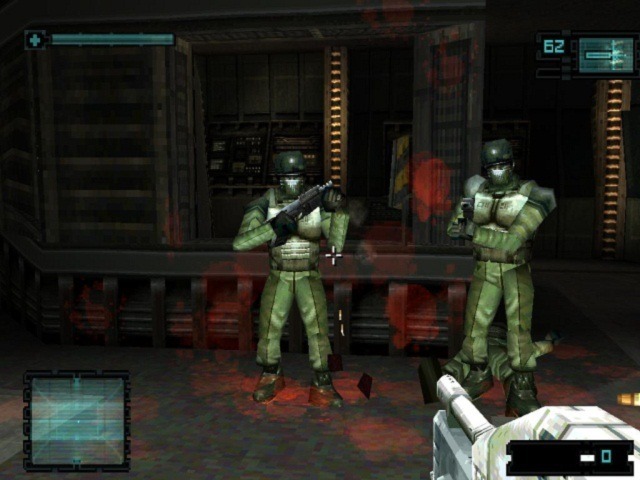 None of the schemes allow for the rapid, precise movement of a keyboard and mouse (you can use the PS1 mouse to look, but are still awkwardly stuck with a controller for movement), so it’s sometimes hard to avoid taking some hits. Your slow movement speed puts you at a serious disadvantage at close range, and Aliens leaping out of nowhere often exploit this. There are a few blatantly obvious (and cheap) moments of spawning enemies in behind you, which immediately put you in a situation difficult to escape unscathed. The limited auto-aim won’t help you recover from the controller’s limitations either. Luckily, it’s never unplayable if you choose to stick with it. A.I. is also a little flaky, and the whole game appears to rely entirely on scripting for any variety. Aliens will nimbly, and impressively, rush down a corridor by leaping from wall to wall – but reload a checkpoint and they’ll do it the same way every time. Or, wait for an Alien to stop its acrobatics and land on the ground, and it will default to charging mindlessly at you while standing straight up. These issues make it a strange choice to start as – and remain – a PlayStation exclusive. I think this game could have made a killing if it was released on PC, with upgraded textures and the precision of a mouse and keyboard. Unfortunately, it never made it off the grey console. Unofficially, I’m not sure if the PSX mouse support means this translates well to emulators, but I suspect that’s a viable modern option. Still, it’s important to stress that these are barriers, but not fundamental flaws with the game. The game itself is still scary fun and solidly designed. It’s easily one of the best Alien games, easily among the top FPS games for the PS1 (much better than Alien Trilogy), and arguably one of the better console FPS’s out there. It doesn’t look like a modern title, but it does play like one, and it balances action and survival horror with some impressive skill. Easy sell for fans of the franchise, and a decent choice for anyone to check out on the cheap. Pretty impressive Aliens game, and better than the movie it’s based on. Fully 3D, plenty atmospheric, smart controls. Heavy texture warping; typical for the PSX. Noticeably scripted. Requires precision the controller doesn’t always bring. Great review. I always thought this game was underrated. 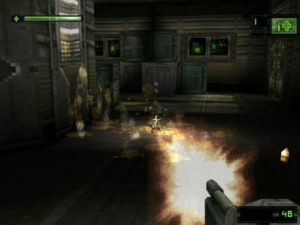 With this game, I’ve had some difficulties, from the just start of the game: the pistol – your every hero -, seemingly, doesn’t sport enough ratio to put against the bigger bugs, to not to speak about face huggers: I’ve discovered that a well-placed shot is capable to blow the Alien-soldier’s head off, but it’s a lucky instance, payed by the numerous charcters’ deaths, before you can master you aim, to center the right pixel. As it has been stated, the bugs are quick at kiling – thas is, before you can reach a double-barreled shotgun! There are timed missions, that become terribly frustrating with your – oh, “running”? Add some treat from the mixed packs “Alien-soldiers/face huggers”, and you get some true trouble! Somewhere, in my experience, I’ve started to cheat – not because I left my FPS-player’s courage back at home, on a farty sofa, but because I’ve seen my character incapable, with her/his slow movements, to react properly to many situations with multiple-angled/breed attacks. Might be a controller’s issue, but the development itself puts you in an situation, when you have all the best weapons but cannot use them properly, when you need to (regardless the control’s combination that allows yo to turn yourself 180°)! So I gave the game to my friend, telling him that, if he liked it, he could ceep it. It is a good game, though, and it sported many things that its predecessors just tryed and left alone, but I’ve found it too hostile to play. As you say, it could be a good PC game, but nobody bothered (unfortunately). I’ve had this game for nearly 15 years now and I’ve never finished it. I’m playing through it now because I wanted another go at it. Fantastic game for its time. It really reminds me of old school quake and doom. The controls are quite forward a pioneering for their time (same controls as modern games [call of duty, halo, borderlands, Destiny] all have the same controls for movement) but in my humble opinion, its one of the best I’ve played. It brings me back to the days when I was an eight year old playing doom and duke nukem 3d scared to go into the next room. If I could have a say in the ratings, I’d give it a solid 8.5 or 9,out of 10. Its level design is great, but there could be more detail. I feel like im running around the same corridors over and over. But hey, thats what quake was like; running around corridors through the whole game. And to be a little Dickish; if one cannot finish the game due to it being “too hard” grow a pair. Its a ps1 game. Games were way harder in the 80’s And 90’s. Remember Megaman and Mario?